The three vacuum pump types, which are normally considered for VRU operation, are rotary vane (RVP), screw (SP) and liquid ring (LRVP). All three are positive displacement pumps. The liquid ring vacuum pump is a wet vacuum pump, the screw pump is a “real” dry vacuum pump, and the rotary vane pump is often referred to as dry, but is actually an oil-lubricated pump. All types of vacuum pumps have their advantages and disadvantages, but when seeking information about what these are, the answer is often influenced by the preference of the user or the economic interest of the supplier. In Cool Sorption, we offer oil-lubricated rotary vane pumps as our standard vacuum technology because we believe that our customers will be the most satisfied with this choice – both short and long term. The pumps have proven themselves to be extremely robust and have low power consumption and low investment cost. However, we wish to be open about the background for our choice, and the following list of advantages and disadvantages of different vacuum pumps is based on information from multiple-technology vacuum pump distributors as well as our extensive experience from many years of using vacuum pump technologies. A rotary vane pump works by gas entering through the inlet port. The gas is subsequently trapped in a chamber formed by eccentrically mounted rotors (called vanes), which then compresses the gas before expulsing it through the exhaust valve. The vanes can increase or decrease in length to fit to the edge of the cylindrical chamber at all times. The exhaust valve is spring loaded and discharges the gas when the pressure inside exceeds atmospheric pressure. To seal and cool the vanes in the pump, oil is used as a lubricant. The pressure/vacuum that can be achieved with a rotary vane pump depends on the number of stages used and their tolerances. More robust than the screw pump, resulting in lower maintenance cost over time than for the screw pump. Can often operation for a very long time (10-15 years) before an overhaul is actually required. Can in most cases be repaired on-site in case of breakdowns, and the VRU can thus be back in operation fast. Significantly cheaper than the screw pump (approx. the same as the liquid ring pump). Much lower power consumption than the liquid ring pump (approx. the same as for screw pump). Can achieve lower vacuum than the liquid ring pump (≈20 mbar), eliminating need for booster in normal operation. 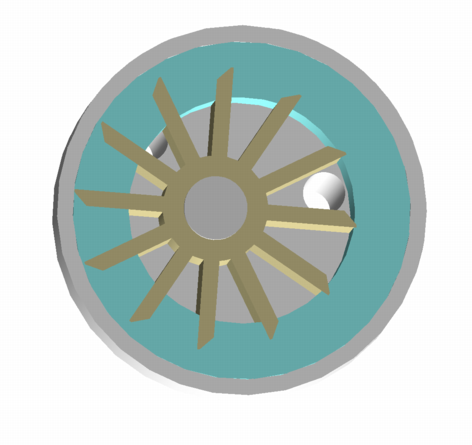 Low design pressure due to oil separator material – bursting disc needed for explosion protection. Low temperature issues due to viscosity increase of oil –however, this is easily solved by heat tracing and insulation. Limited capacity range compared to liquid ring pumps. The screw pumps used for VRU operation work by using two screw rotors, which rotate in opposite directions. This traps the gas between the cylinder and the screw chambers and transports it to the gas discharge. Sometimes required by the customer due to lower power consumption (on paper) and maintenance/spare parts cost (on paper). Much lower power consumption than the liquid ring pump. Has lower power consumption than the rotary vane pump on paper, but at real operating conditions, the power consumption for the screw and rotary vane pump is approximately the same. High design pressure compared to rotary vane pump, as no oil separator is needed. This eliminates the need for bursting discs as explosion protection. Low maintenance cost if operated correctly, but this is often not the case due to very delicate system. Is very delicate to operate correctly and very sensitive to incorrect operation. This very often leads to high maintenance cost. Can normally not be repaired on site, but must be taken to an official workshop. This makes it more costly to repair and results in much longer downtime for the VRU. Low temperature issues due to very narrow design range for size of screw compared to the housing. Low temperatures lead to shrinking of the housing compared to the screw, which will lead to damage of the pump if operated. Significantly more expensive than the rotary vane and liquid ring pumps. The liquid-ring pump compresses the gas by rotating a vaned impeller located eccentrically within a cylindrical casing. 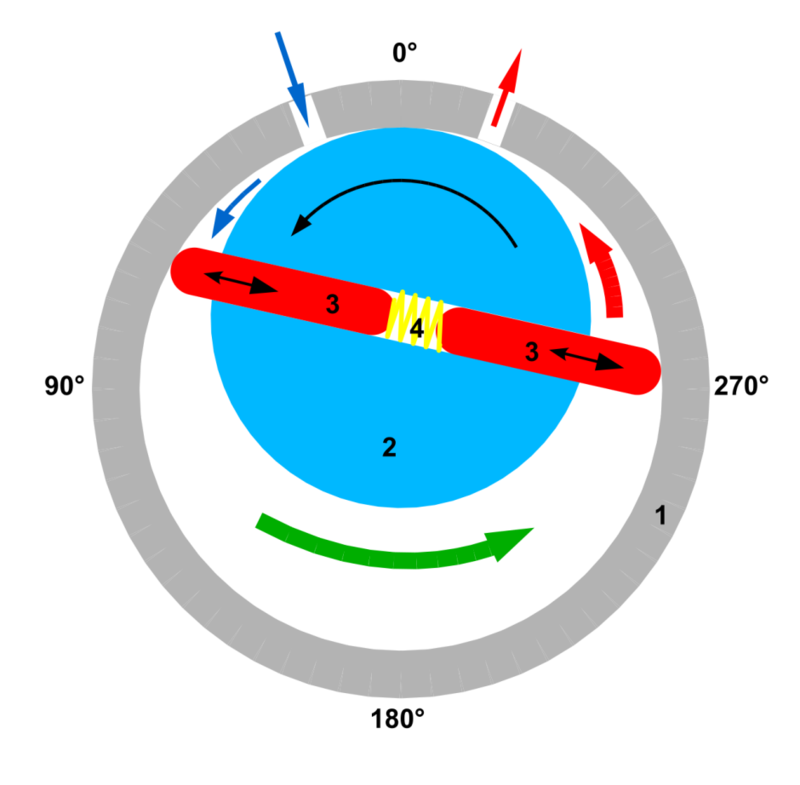 Liquid (a glycol-water mixture is used by cool sorption) is fed into the pump and – by centrifugal acceleration – this liquid forms a moving cylindrical ring against the inside of the casing. 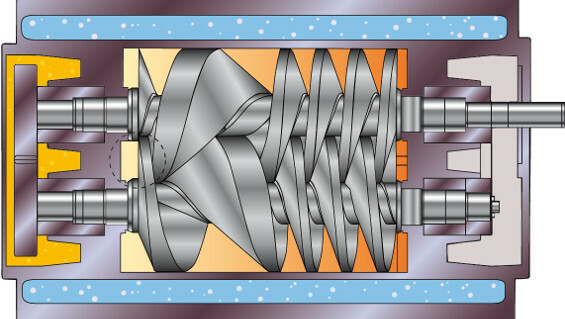 This liquid ring creates a series of seals in the space between the impeller vanes (see picture), which form the compression chambers. The eccentricity between the impeller’s axis of rotation and the casings geometric axis results in a cyclic variation of the volume enclosed by the vanes and the ring. This compresses the gas and discharges it through a port in the end of the housing. This pump has a simple, robust design as the shaft and impeller are the only moving parts. Significantly cheaper than the screw pump (approx. the same as the rotary vane pump). Very robust to dust, metal parts or most other physical “pollutions” to the system. Very low spare part cost. Only requires small refill of glycol over time and every couple of years. No filters required. Very low maintenance cost due to high robustness. Very large range of capacities (up to >20.000 m3/h), resulting in lower footprint compared to rotary vane and screw pumps for large capacity VRUs. Can be made in a wide range of materials and sealings – this is not possible with the rotary vane or screw pump if client wishes it or if special conditions require it. Much bigger energy consumption than the rotary vane and screw pump. Cannot achieve as low vacuum as the rotary vane and screw pump (≈ 100 mbar). This means that a booster is required if we need to guarantee 150 mg/Nm3 emissions. Requires a sealing media, which adds extra complexity to the system. Due to the higher robustness and lower investment cost of the rotary vane pump compared to the screw pump, and the lower power consumption compared to the liquid ring pump, the rotary vane pump is the preferred pump for normal Cool Sorption VRUs. However, special circumstances might make other choices of pumps more advantageous on a special case basis, and sometimes clients have special wishes for the choice of pumps. In these cases, Cool Sorption will – as always – advise the client on best technology for the project, and we may subsequently choose another pump technology for the VRU.